When you lose a tooth, you may feel it is not a priority to have it replaced. Although it may only be one tooth, it plays a vital role in your oral health and functions. If you do not replace it a variety of complications can develop. Not only do you lose your self-esteem, your ability to eat many of your favorite foods, and being able to speak clearly, but you also lose density in your jawbone. Over time, this can lead to additional tooth loss and other oral health concerns. To stop the damages, a dental implant in Daytona is the solution you need. At Lakeside Daytona Dentist, we will complete your smile with a treatment that can last for a lifetime. Now, you have multiple treatments available to replace a single missing tooth. 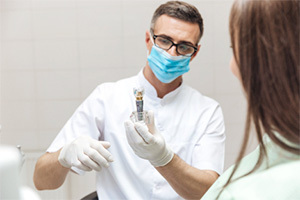 After performing an initial consultation to assess your dental health and to discuss your desired results, your dentist determines which is the right solution for you. 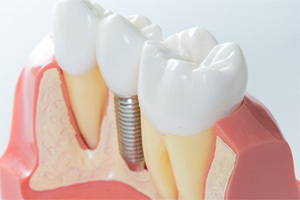 Fixed Bridge: Often called a crown and bridge, this is the most conventional treatment. A prosthetic tooth is crafted to match the appearance of your remaining teeth. It is attached to dental crowns which are bonded to your adjacent teeth to hold it in place. 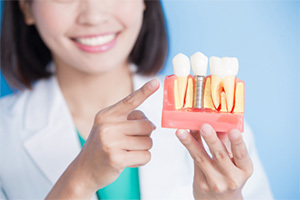 This gives your teeth support to avoid dental drift while also restoring your oral functions; however, you will need to have it replaced about every 5 years. Single Tooth Implant: Dental implants in Daytona Beach have become the preferred treatment because it replaces both the root and the crown. A biocompatible titanium implant post is surgically inserted into the jawbone to replace the root. This stimulates the jaw to encourage new bone growth to create a secure foundation for the dental crown. An abutment is attached to the post to connect a custom-made restoration. Although it requires surgery, it has the potential to last for a lifetime. Improves the health of your remaining teeth. Helps to prevent additional tooth loss. Prevents bite and alignment issues from dental drift. If you have a missing tooth, do not wait to have it replaced. Choose the next best thing to your natural teeth with dental implants. At Lakeside Daytona Dentist, we create the individualized treatment plan you need to make a wise investment in your smile and your quality of life. Contact our office today to see if dental implants are right for you. We look forward to rebuilding your smile.